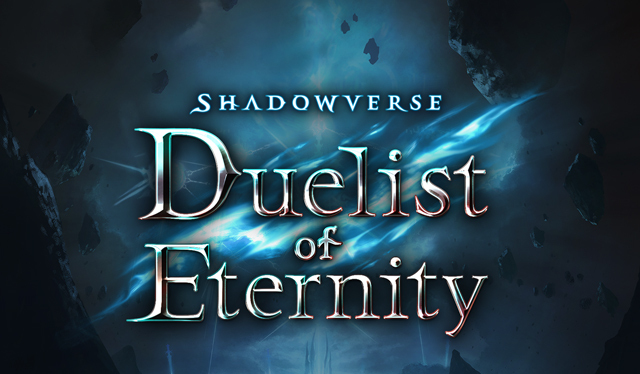 Shadowverse: Duelist of Eternity is a collaboration side story with the Shadowverse franchise. It is unlocked after completing Chapter 14 Story - Rose-Petal Glint . An ominous presence has filled the skies. It is a promise of freedom. A glimpse of new worlds. A light reaching into oblivion. A shadow in mortal hearts. the gates of annihilation will open. Silver Bow has a EX big boost to Wind ATK weapon skill. 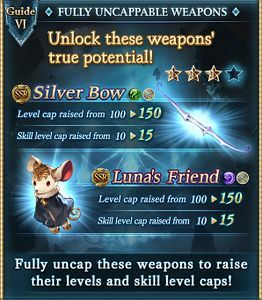 The weapon itself is decent filler, but can be uncapped to 4★ which is powerful compared to other Wind side story weapons. 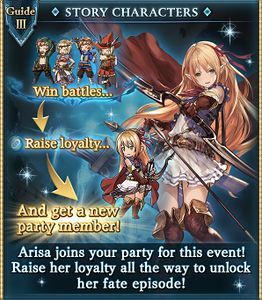 Getting one if you don't have any Wind EX weapon is a priority (you will receive a 3★ lvl 100 copy after completing Ending). Luna's Friend has a EX big boost to Dark ATK weapon skill. Staff-type weapons have the lowest ATK stat in the game. Regardless, it is the easiest Dark EX weapon to obtain in the game since it is accessible to all players. It is worth keeping until you obtain a better Dark EX weapon. 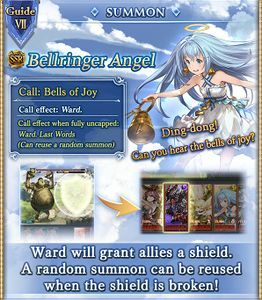 Bellringer Angel has a one-of-kind Call effect which can reset the cooldown of another random summon, but only when 3★ uncapped. 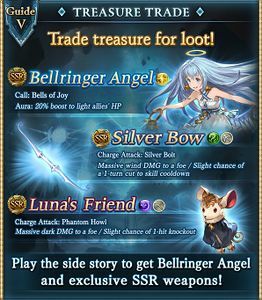 Compared to other side story SSR summons, Bellringer Angel may have long-term potential. 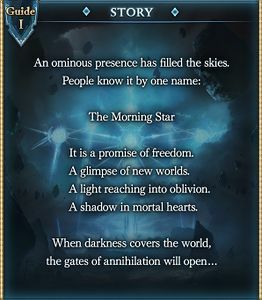 There are only four copies of this summon in this side story. 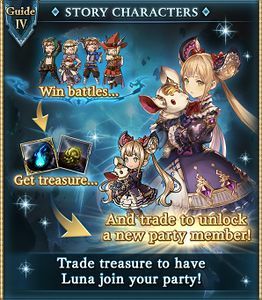 Luna can be obtained very early as the side story progresses. You will at least get Crystal ×50 for completing her Fate Episode even if you don't plan to use her. 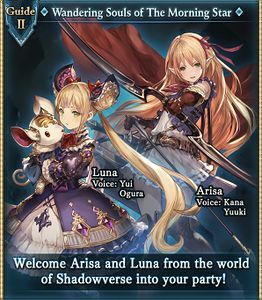 This collaboration side story does not have any cross-over rewards with the Shadowverse game. If you're still interested in Shadowverse, it can be found on Google Play, the App Store, and also Steam. Installation and in-game menus are in English and should be self-explanatory. Benefits from any Bahamut Weapon. Excellent in long battles, but less effective in short battles. Requires knocking out allies to use her skills. Difficult kit to use in general situations. Soul Conversion can act as a pseudo-Tactical Relocation, allowing for specialized setups without needing Nighthound. Gimmick character, but not completely useless. Cost to Host: 20 AP Unlock: Clear Stop the Clay Statues! Guardian of the Fairy King 妖精王の守護者 ★ Get 100 flower rings Crystal ×30 No longer available. This page was last modified on 5 January 2019, at 16:12.